Is he a perfectly colored Tuxedo Cat or what? It was the day before thanksgiving 2007, and it had been snowing all afternoon. 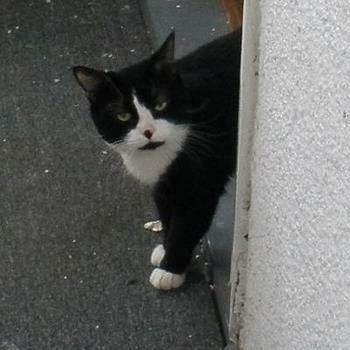 Buddy was crouched just barely below a step on the stairs leading to the building lower level. I just saw his 2 ears when I stepped into the apartment building entrance. He was obviously very scared and put up virtually no resistance when I picked him up and brought him to my apartment. Little did I know how quickly this would all change. 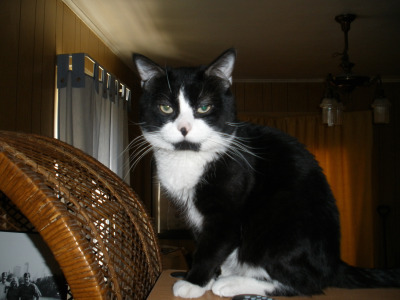 Buddy was an UNEUTERED male cat in the midst of his sexual prime. I left him alone in my apartment to run to the grocery store to get him some food and basic cat supplies. I was gone for MAYBE 45 minutes. 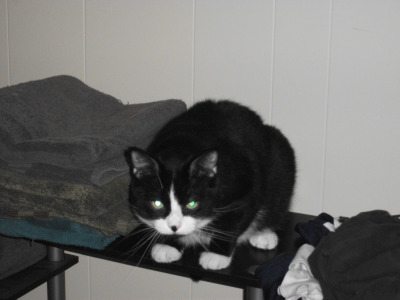 By the time I got back Buddy had "Marked" my clean laundry and was terrorizing a mouse in my closet. He was also letting out the most ear shattering yowel of sexual frustration I have ever heard. That's how he got his name, because I remember looking at him and saying: "I hear ya Buddy, but neither of us getting laid anytime soon...sorry"
I loved the story and what an awesome person you are to welcome Buddy into your home. I hope you both have a wonderful life full of joy! I too really like the pose where he is standing in the doorway looking up at the camera. A pretty good story, indeed. I had a good laugh. Poor Buddy. Sexually active cats can get pretty wild when kept indoors. I've never had this experience. But when I was little one of our cats wrecked havoc in our house when he reached his "puberty". We had a big house and he had access to the garden. He would also get out into the neighbors' yards. Sometimes he would disappear for days at a time. So is Buddy neutered now, or does he still suffer from this affliction? Thanks for sharing Buddy's story. I love the pictures!